Close to a year and a half ago I decided I wouldn't upgrade my PDA (at the time a Sony SJ30) until someone came out with a 320x480 tablet PDA that suited my needs. I passed on the Palm Tungsten T|3 because of the slider and short battery life. Finally, Sony released the TH55. The TH55 seems designed to be a upper middle-end handheld with a well rounded feature set best put to use for productivity. Essentially, its main competition is the Palm Tungsten T3. It eschews serious multimedia and gaming functionality in favor of an enhanced PIM suite and long battery life. This isn't to say that it doesn't perform well in non-productivity situations, but there are other handhelds on the market that serve these purposes better. Its implementation of photographic and wireless networking capabilities are geared towards getting business done, not entertainment, despite the fact that this still carries Sony's "Personal Entertainment Organizer" moniker. The TH55 is smaller and thinner than I had expected. It fits comfortably in my hand and has a satisfying heft. It has roughly the same volume as a palmOne Tungsten E, while it is longer and narrower and slightly thicker in parts. It doesn't bend or creak with gentle pressure. 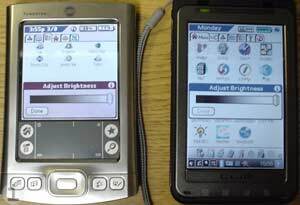 The screen dominates the front of the handheld, with four application buttons on the bottom and a status light bar at the top. The rest of the handheld body is of a grainy, lightly textured, slightly sparkly black plastic. It feels great in the hand, and makes me feel more confident that the PDA won't slip out of my hands. The casing is both scratch and fingerprint resistive. The bezel surrounding the screen is a gunmetal colored material. It contains a microphone in the lower left-hand corner. The status panel has three lights. On the left is a power light, which is steady green when the handheld is on, orange when it's being powered, off when charged and turned off (green when charged and turned on), flashes orange as the LCD alarm, and flashes green when a button is pressed while the hold function is engaged. Next to that is the record light, which glows red during voice recording. At the far right is the WiFi status light ("WLAN"), which glows green while making or maintaining a WiFi connection. Models with Bluetooth functionality have a fourth light for its connection and standby modes. I would have preferred if there was a separate light for the alarm, rather than using the power light. Otherwise the status light panel looks professional and is a very nice touch. The top of the handheld contains the hinges for the removable lid. Taking it off (and putting it back. on) requires a little more pulling and force than I feel comfortable exerting on the handheld body. I did successfully remove the cover, though, and only recommend this process to people who plan on going without it. Don't just idly remove it for no reason, reinserting it scratches up the hinge a bit. I'm fond of the lid, but I wonder if maybe in the future I won't like it as much. 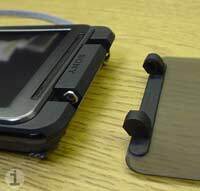 Like the T3's slider, it might get annoying having to open part of the PDA to fully use it. It has a slight wobble to it that bothered me at first, but now I don't even notice it. The plastic of the lid is smoky and clear, and the screen is visible through it, though perceptibly dimmed. The lid shows fingerprints and grime a little too well (it's quite shiny), but can be wiped crystal clear with a soft, optical cloth (the kind available at most optical stores works perfectly). For quick looks at the screen, however, it's fairly easy to focus through the grunge. Its protective value is questionable, but I feel reasonably confident it will protect against any direct screen trauma. The four application buttons will likely be a deal breaker for avid gamers. They are all in a row, no space between each, no up/down button in the middle. They can be pressed when the lid is closed, which is a good thing to me. I can check my calendar or look up an address without opening the lid. This also makes the hold button quite indispensable. The buttons come preprogrammed as follows (from left to right): Clie Organizer (CO) calendar, free notes, CO, and the CO assistant. The first three are powered buttons and can turn the handheld on. The fourth is not powered, and functions solely to pop up an assistant menu, enabling the user to search for or add PIM information into the CO. Hitting the CO button repeatedly selects each CO tab in order from top to bottom. One of the first things I did with the TH55 was reprogram the free notes and CO buttons to my favorite notepad and to do applications. Having one button assigned solely to scrolling through the different areas of the CO seems completely redundant to me, as the same thing can be had by clicking the back button and scrolling with the jog dial. The primary benefit to this button's original function is to open the last CO tab you were on when you previously used it. Assigning this button to the CO address book seems more practical. The only button that can't be reassigned is the assistant button. There is, however, a small utility made by a Japanese developer called THe Go! Go! that can remap the capture button to be a power button (when the lens cover is closed), the voice record slider to a hotsync button (local or modem), and turn the fourth application button (the CO assistant) into anything you want it to be. Keep in mind, though, that the fourth button still isn't a "powered" button. This means that even if you map it to something else it still can't be used to turn the device on. The IR port is on the right-hand side, towards the top. Strength and speed of transfer seems about average, and files can be beamed between both OS5 and OS4 PDAs. The left side of the PDA contains (from the top) the headphone jack, the image capture button, the lens cover slider, the memory stick slot, the power/hold slider, and the voice record slider. The memory stick slot has a locking cover made of the same plastic as the rest of the body. I'm a little dissatisfied with the side button layout. The power button is difficult to press when holding the unit in my left hand, and I don't like having to do a two-handed power on every time I don't want to press one of the application buttons. The voice record button is fine, since it's out of the way and I almost never use it. The camera buttons are in the best possible place, and make picture-taking fast and easy. The back of the unit is made up of the battery cover (not technically a removable battery, but it does look potentially user-replaceable), accessory clip slot, the speaker, camera lens, jog dial, left/right navigation buttons, back button, stylus silo and a slot for the included wrist strap. The bottom of the handheld contains a reset button (designed to be pressed with the tip of the stylus) and the standard Sony serial port. This is the same port as in most recent Sony handhelds. It fits the same sync/charge plugs and cradles as the rest of the Clies. A cradle is not included with this handheld. The jog dial, one of the more unique aspects of this PDA, is designed to be ambidextrous. When I first heard about the TH55 I thought I'd found my dream handheld, then I saw the navigation layout and thought maybe it wasn't. When I went to the store, not expecting to like the jog dial or buttons, I was surprised by how quickly I took to it, and after a short time of use it became a major selling point. With that said, it may be a problem for other people. For people who aren't sure how they'll feel, I think this may be one of those times when hands-on use is the only way to decide if the layout will work. Overall I find using this jog dial and navigation button layout more comfortable in the long term than using the traditional left-side oriented jog dial/back button layout or the bottom area nav-pad layout. Granted, putting your hand into the correct position to fully use the jog dial and navigational region takes a little extra time (and more-or-less precludes the use of a standard case), but I think it's worth it. I can easily manipulate all buttons on the back with either hand, and I can sit and use the jog dial to read for hours without the wrist and finger fatigue I used to experience with a traditional jog dial placement or using the buttons at the bottom of the handheld. Since I'm a woman with smallish hands, I had a male friend with larger hands play with the handheld and judge the rear button layout. He found that the back button was in a position where it was too close to the other buttons to be pressed easily (a problem I didn't run into). Likewise, he complained that the left and right navigation buttons were too closely spaced around the jog dial for comfortable manipulation. This may simply require a longer adjustment period. The included stylus is the same as the one for the UX and NX series Clies. It is a tiny, retractable debacle. It's too small to grip comfortably for any length of time. It locks lightly into the extended position, but not when collapsed. This means that it can shake out of the silo enough to extend itself, but not actually fall out. As soon as a modicum of grime finds its way onto the thin, extended portion of the stylus the movement of expanding/collapsing the barrel stops feeling smooth and fluid, but more scratchy. The TH55 runs Palm OS 5.2.1 and comes with 40 MB of internal RAM and 32 MB of ROM. 32 MB of the RAM is user accessible, 7 MB is reserved for the system. The processor is the Sony Handheld Engine, which debuted on the UX series. Its speed varies between 8 MHz and 123 MHz, depending on system demand. Overall I've had few performance problems with this handheld. MP3s and movies play very well, but large flash files (my test movie was 3 MB) are nearly unwatchable, even set to lowest quality. I did not, however, ever have the machine freeze up or otherwise crash due to processor overload. For the record, my 3 MB flash movie sounded great, it just didn't play smoothly. The visual did keep up with the audio, but was extremely jerky. I shouldn't be too disappointed, the same flash movie looked a little choppy on my old computer (a 400 mhz iMac). The sample flash files that came on the install CD run nicely, but they're all very small. One place where the processor seemed a little weak was when opening a large (75 KB), encrypted Excel spreadsheet natively in Documents to Go 6. It took around 25 seconds to open. A smaller Word file (11 KB) opened instantly. The TH55 has a 320x480 ("hi-res+") portrait-oriented, 65k color, transflective, backlit display. The bottom of the screen has the standard dark gray collapsible digital input area (DIA), similar to other Clie Hi-Res+ handhelds. The ever-present status bar at the bottom of the display has software buttons for home, menu, find, silkscreen theme/input options, battery status, memory stick information, WiFi status, system volume controls, and a clock. Brightness adjustment and calculator buttons are only available when the DIA is expanded. The silkscreen input format can be changed between Graffiti 2 and Decuma Latin input. Decuma has been available on several previous Clies, but only the NX80, NX73 and TH55 have it available as a built-in skin for the DIA. The brightness of the screen is good, but not mind-blowing. I prefer a slightly dim screen over short battery life, and this screen has been bright enough for every situation I've used it in. With that said, it's not quite as bright as a Tungsten E, but stands up nicely to it. I held it next to a Toshiba e805 in a well-lit electronics store and the e805 was noticeably brighter. Compared to a T|E, the TH55 has a slightly bluer screen, but on its own I find the colors to be rich and true-to-life. The one issue I have is that reds tend slightly towards the pink end. Oddly enough, in low light settings with the backlight up, colors look richer and warmer through the flip cover. In bright sunlight the screen does wash out considerably, and using the flip cover doesn't help much in direct light, as it produces more glare than anything else. The washout on this is to the same degree as other Sony handhelds I've used in bright, direct sunlight, and I find that the handheld is perfectly usable under these conditions, it just takes some getting used to holding it at the appropriate angle to use the sunlight reflection to the screen's advantage. The display does not have built-in rotation capabilities, but I've found that several applications support screen rotation. PalmReader and TealDoc are among those, and they both look very nice in landscape mode. Some applications that, disappointingly, don't provide their own means for screen rotation include Documents to Go and the pre-installed NetFront web browser. This limits their usefulness in some situations, such as wide web pages and even wider spreadsheets. The TH55 comes with built-in 802.11b wireless networking (WiFi). The antenna is located just to the left of the stylus silo at the top of the unit. I tested the handheld's wireless capabilities in a public WiFi network, getting somewhere between 40-80% of the signal (depending on where I stood), with the power save both on and off, browsing with NetFront and doing a little AIM chatting via Verichat. With power save on, browsing is a little slower, and big web pages took an eternity. Small pages, especially those optimized for PDA screens, loaded quickly and looked great. With power save off, I found browsing standard web pages much better, but still slower and more frustrating than using a full-sized web browser. I successfully (and frequently) checked my email via webmail on NetFront, and found the experience to be completely tolerable. I did, however, have some problems with my connection dropping off unexpectedly at the lower strengths when I was using the power save feature. This didn't happen when power save was off. Occasionally initial web site connection and loading time could cause the PDA to seemingly stall out, but a little patience proved that this was not the case. I don't know whether to attribute this to the WiFi speed, the NetFront software, or the relatively slow processor. The TH55 comes with a built-in 310,000 pixel (640x480) camera. 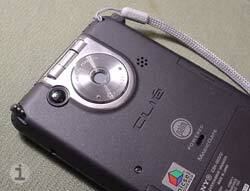 The lens is located on the back of the handheld, with the capture and a lens cover button on the side. Pressing the capture button or sliding the lens cover open automatically turns the on the handheld and opens the camera application (unless the hold switch is engaged). The screen is used as the viewfinder. With the buttons positioned as they are, pictures can easily be taken in either portrait or landscape orientation. Also, opening the lid is not necessary, as it's easy to view the screen and compose a picture through it. The camera software includes 2x digital zoom (crops the middle of the shot and blows it up to 640x480), a timer mode, and settings for white balance, brightness, flicker control, and "effects" (black and white or sepia). Picture quality is mediocre, with a tendency towards overexposure when using the automatic brightness and white balance adjustment. There is significant blue fringing around brightly lit objects. Photos taken with the zoom are blurry and pixelated. 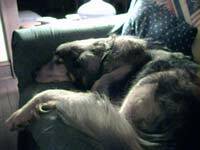 Low-light pictures are grainy. This camera seems best suited for very quick snapshots and taking casual photos of people for their address book entries. Below are two unedited sample images taken with the TH55. The first is outdoors in sunlight, the second was shot indoors in relatively low light. The flicker control means that it's possible to take pictures of computer or television screens without seeing the refresh flicker, handy for taking a snapshot of a screen in a pinch. 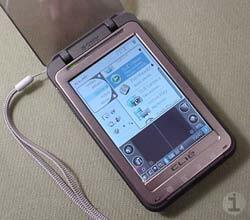 Built-in MP3 playback has become a standard feature on most Palm OS PDAs, so I don't feel that it requires much discussion. In my testing, I've found that the audio quality through the headphones with the TH55 is plenty loud and pretty decent compared to other portable MP3 players. The external speaker quality is a little low, as it is tinny and sound is easily distorted at high volume. The speaker does, however, sound fine for sounds that go along with movie files. It's not nearly as good as listening through headphones, but for a 5 minute short it's listenable. Sound does distort through the headphones at very high volume, which is much louder than I've needed it to be. The voice microphone is good, quiet talking is picked up without much interference from background noise. For best results, the microphone should be pretty close to the sound source. I don't know how much good this microphone would do for recording lectures, meetings, etc. It seems designed exclusively for short voice notes at close range. Voice memos are stored as WAV files and can be used as alarms. In general I've found the battery life on this handheld to be superb. I decided to give it a heavy use test, and spent 24 hours after a full charge wirelessly web surfing with the power save off, playing video games, reading, listening to music, and watching videos with the screen brightness on medium or high. This made up for a total of about 5 hours of use. The battery never went below 80%. The other test has been going on for several days now, and is my typical light usage. I keep the backlight at whatever level is most appropriate. This means that during the day, under the fluorescent lights at work it's typically on high. The rest of the time it's medium to low. I use alarms, have data automatically backed up to the card, look at pictures and videos, write in Docs to Go, use the PIM functions, sync daily and use the PC Link to transfer data to and from the MS, etc. After about 5 days of 1-2 hours use each day, the battery is currently at 54%. And, no, I haven't been charging the handheld while hotsyncing. I've essentially abandoned my charging cable until I get a low battery warning, just to see how long it'll last. It's worth mentioning that the battery software seems to display percentage not just based on volts, but on current energy draw (which I think is pretty common). So, after playing about 15 minutes of videos with the backlight all the way up, the battery had dropped from 85% to 77%. A little while later it was back up to 80%. I plan on using the handheld without charging until I reach my first low battery warning. I honestly have no idea how long it will take, and Sony's website claims 15 days of "normal" use. This review will probably be posted before I charge my TH55 again. Sony has chosen to debut its new Clie Organizer software suite on the TH55. This is an alternative set of PIM applications to replace the standard PalmSource applications (don't worry, they're still there, too). Because the CO is a fairly massive piece of software, it will be discussed in detail in an upcoming review. For now here's the basics. The CO uses a tabbed interface to enable fast switching between each of its component applications. From the top, these are the Datebook, Address, To Do List, Free Notes, Memo Pad, Viewer, Reference, and Applications. By default the home button is mapped to the CO. Pressing the back button selects a tab, scrolling with the jog dial moves between tabs. Pressing the jog dial selects the highlighted tag. The Datebook replacement provides users with the ability to stick pictures, notes, and digital ink writing directly onto the day, week, and month views of the calendar. It does not include a view with the to do list items. It does, however, support a non-user-configurable palette of event colors and icons. The Address tab is a minor improvement over the standard Palm and previous Sony address books. It has two views, one with a simple list view, and another with picture thumbnails for each entry. The To Do List and Memo Pad applications are essentially clones of the Palm software equivalents with a minimalist facelift. The To Do List does provide some enhanced outlining capabilities over the Palm standard, but otherwise is the same. The Free Notes tab functions in either thumbnail or list view modes. Notes can be composed on a user-selectable color background and a palette of pen colors. The Viewer tab is a simplified interface for the standard Clie Viewer application. Images, free notes, and movies can all be viewed or deleted from this screen. The Applications tab is effectively the same as the standard Palm launcher (not to be confused with the standard Clie launcher) with a section at the bottom for placing short cuts to frequently-used applications. The Reference tab appears to be Sony's showcase for Picsel-powered documents. It contains 3 PDF-style pages. There is a standard conversion table for length, area, capacity, etc; a size chart for clothing, shoes and rings; and a temperature and precipitation chart for several large cities around the world. The reference documents can be deleted but new ones cannot be added. This possibly is the least useful piece of software I've ever seen. The same information is available in much more user-friendly formats for third party database applications like TealInfo and MobileDB. Even carrying around a few spreadsheets in Docs to Go seems like a good idea compared to this. On the subject of Documents to Go, it should be noted that, rather than having the standard version on the install CD, Sony has instead partnered with DataViz to provide a fully licensed version of Documents to Go 6 Professional (for Windows only) to customers who register their handhelds at the Sony website. Mac users are entitled to 40% discount on Documents to Go premium with their registration and the code provided thereafter. Decuma comes preinstalled on the handheld as an optional skin for the DIA. It is a good method of input, especially for those who were never very speedy with Graffiti in the first place and/or dislike Graffiti 2. I find that I'm still faster doing my input one character at a time, though I do switch to Decuma every once in a while for a little change. In addition to the titles already mentioned, this Clie comes with a few other pieces of software worth mentioning. Preinstalled are AudioPlayer, SoundUtility, Flash Player, PicselViewer, Movie Player, Clie Viewer, Clie Mail, a help application called Clie FAQ, Card Info, Clie Files, Data Import and MS Backup. The installation disc comes with Clie Organizer for Windows and host of demo software including Agendus, Vindigo, and Warfare Inc. It also contains a collection of multimedia samples, in the form of sounds, movies, flash files, and pictures. The extra demo applications and sample files are easily installable by Mac users, but Clie Organizer and Palm Desktop for Clie are only available on the disc for Windows installation. I bought the TH55 because I needed (er, maybe just wanted) a PDA with a nice, big screen, great battery life, modest multimedia functionality, and wireless networking capabilities. With that said, the TH55 has exceeded my expectations. The battery life is above and beyond what I could have expected, especially considering it's an OS5, multimedia-capable, ARM-powered handheld with a big screen. The TH55 has served my needs beautifully, but I realize that it may not suit the needs of all users. The slower processor and minimalist button arrangement will be a major turnoff for some users. Also, a few people might not find the jog dial and navigation button setup as ergonomically friendly as I have. The TH55 offers an excellent balance of features for its price. The Sony Clie TH55 has a list price of $399 from SonyStyle.com, and can be found for around $339 USD at some other web stores.